I shared the sour cream and onion cucumber salad and had so many requests for the plain vinegar variation, that I figured instead of pointing everybody to the variation at the bottom of the recipe, that I would plant it here right beside that version, to include it among all of the other summertime cucumber salads I enjoy. It's really the same basic process with an adjustment in the dressing ingredients. For the dressing, whisk together the vinegar, sugar, pepper and celery seed. Halve and slice the onions into thick slices, adding to the dressing with the cucumbers. Some folks add water to their cucumber salads, but I do not. I find that it dilutes the dressing too much and by turning or stirring the cucumbers regularly as they marinate, they continue to give off sufficient water for me. Toss, cover tightly and store in refrigerator until well chilled, stirring occasionally. Toss again before serving. I continue to refresh the cucumbers and onions until the dressing looses it's punch. For more of my favorite cucumber salads, visit my page on Pinterest! For the dressing, whisk together the vinegar, sugar, pepper and celery seed. Halve and slice the onions into thick slices, adding to the dressing with the cucumbers. Toss, cover tightly and store in refrigerator until well chilled, stirring occasionally. Toss again before serving. Cook's Notes: Add a handful of halved grape tomatoes just before serving. Vary the ingredients according to your own taste, for instance, more or less vinegar or sugar. I sometimes add about 2 teaspoons of fresh dill from my garden and/or a teaspoon of pickling spices for added flavor. Some folks add water to their cucumber salads, but I do not. I find that it dilutes the dressing too much and by turning or stirring the cucumbers regularly as they marinate, they continue to give off sufficient water for me. 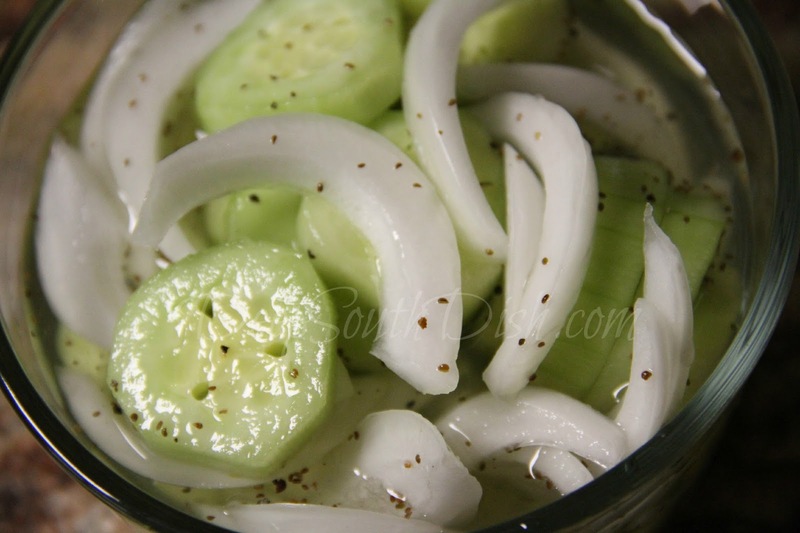 You can continue to refresh the cucumbers and onions until the dressing looses it's punch. I make this all the time. But, I don't always use a Vidalia onion. I think it is just as good, or even better, with a large yellow onion. The sugar is also optional. Sometimes I want it, sometimes I don't. Oh indeed, there are many variations of this salad - this just happens to be the way that I enjoy it Joan! Vinegar alone is far too sour for me, so I do like the sweet and sour blend of vinegar and sugar, as with most Southern salads like this, though I use sugar substitutes many times, or a stevia and sugar blend for something more natural. That's an individual preference. I also find yellow onions to be far too strong for me and I much prefer a Vidalia over yellow onion just about anytime, but most especially when it is eaten raw! At any rate, this is a salad that is highly adaptable... of course! This is just me sharing my recipes on my own blog for those who are interested, but I appreciate you stopping by and taking the time to comment with your version as well. Your timing is perfect; I picked our first cucumbers just yesterday. We make both the sour cream and vinegar versions and never tire of either. And when the zucchini begins to flourish we just swap them out. Gotta love those garden cukes Charlene! Thanks Charlene, I never thought about swapping the zucchini for the cukes, that's a good idea! I like cucumber & onion salad any way it's made. It's especially good when the veggies come from your garden. Oh yes, especially those garden cucumbers! Oh yes, love the combination with dill too! I use dill in the similar sour cream version of this salad just to mix it up a bit. Either way, it's delicious & one of my favorite salads to keep in the fridge when things heat up down here! I bet that is incredible, but white vinegar, or apple cider vinegar are the two lighter vinegars I keep and I guess the most common, so I did write the recipe for that. If I can remember to pick up a bottle of the WWV I'm sure gonna try that too though, thanks! Hope you enjoy the recipe Joan! I just made some of this recently using my bread and butter pickle recipe stored in my memory for years. I like to add sweet peppers to mine too. I salt and ice my cucumber slices and then rinse and drain. While they rest a while I heat the vinegar mixture with pickling spice to a boil and strain while I pour it over the cold veggies and let it cool. You don't even have to peel the cucumbers but I prefer them peeled myself. Love this stuff.